...and found herself standing at the side of the bed, staring into the empty eyes of the dead queen. Eyes that had once belonged to her." This sounds like an interesting book. I have been contemplating reading it. I hope you enjoy it. Ohhhh this sounds so creepy!!! I'm definitely looking forward to it now :) Great teaser!! Scary! Here is my teaser for this week. Eww, too spooky and creepy for me! Wow! Sounds like a good book! WOW. Omg, what happened???? That totally makes me want to read it! Great teaser! Nice teaser! Read this one awhile back and thought it was pretty interesting! Hope you enjoy the rest! 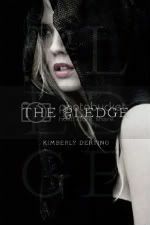 The Pledge is such a good book. I can't wait to see what you think. Great teaser and a great hook - I'm interested in knowing more. Wow! a very intense teaser. Yikes! Oh, wait. Is she expecting that? Ok that's interesting. Hmmm... good teaser. Eeash! I got goosebumps! I can't wait to read this one!